Typically, when filters are applied in SAS Visual Analytics it affects all the records and aggregations in linked objects. For example, in a typical sales report below, when filters are applied, it changes all the measures of linked objects. With this kind of filtering, it becomes difficult to calculate measures which requires a different level of aggregation. In above image the expectation is that the ‘Total Customers’ should not be changing irrespective of ‘Region’, ‘State’, ‘Category’ and ‘Subcategory’ control selections. ‘Total Customers (Geo)’ should be changing only based on ‘Region’ and ‘State’ control selections. ‘Total Customers (Geo and Prod)’ should be changing based on all the controls mentioned above. In the above example only, a ‘Total Customers (Geo and Prod)’ calculation is correct. We will learn to create measures with different levels of aggregation by using ‘Customer Penetration’ measure as an example. Selective filtering may be used for creating similar reports like: Dealer Participation, Sales Contribution, etc. The below section exemplifies the creation of a customer penetration report with selective filtering. Customer penetration is used to analyze whether marketing and sales strategies are working or not. Managers often uses customer penetration or dealer participation measures along with other measures to measure the popularity of a product, category or brand. 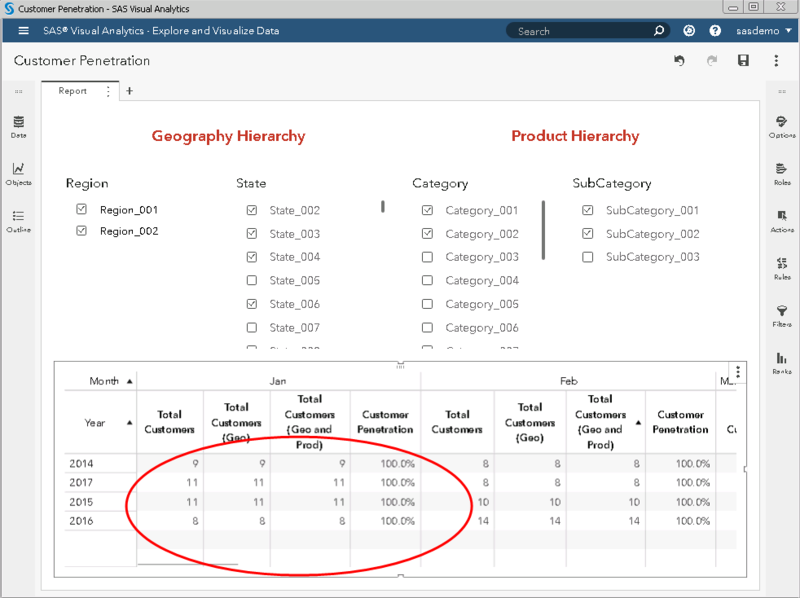 This report requirement is such that the numerator in the ‘Customer Penetration’ formula should be filtered based on region and state list control selections, while the denominator should be filtered based on region, state, category and subcategory list control selections. This is not the same requirement as filtering the whole table through common list controls. In general, if you link a table with any control, all the measures in that table will be filtered as per selected value(s) in controls. However, our requirement is not like that. Instead of linking control and tables we will use control parameters to achieve our objective. Equivalent to ‘Customer_ID’. However, populated only for selected geography levels and rest would be filled with missing. Equivalent to ‘Customer_ID’. 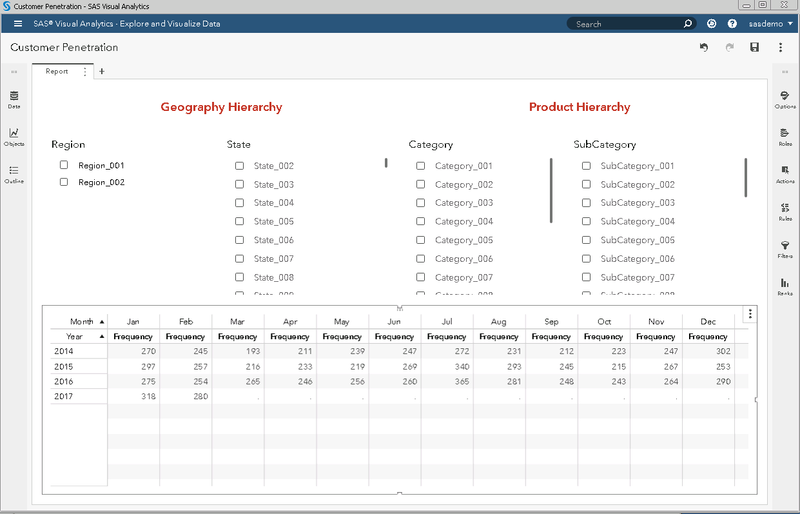 However, populated only for selected geography and product levels and rest would be filled with missing. You need to subtract the distinct count related to missing ‘Geo_Customer_ID’, which is 1. You need to subtract the distinct count related to missing ‘Geo_and_Prod_Customer_ID’, which is 1. Now you can create an aggregated measure ‘Customer Penetration’. If you compare the above images, you will find the difference in highlighted measures where the first image aggregation level is based on selective filtering, while in second image aggregation level is uniform. Note – ‘Total Customers’ is count of distinct ‘Customer_ID’ i.e., total customers count is independent from geography and product hierarchy selection. This process allows you to use control parameters in ‘If Then Else…’ statements to create a variable (calculated item) having character values. You can utilize this feature in several other applications – this is just one way you can use parameters to fulfil a business requirement. Selective filtering in SAS Visual Analytics 8.2 was published on SAS Users. A combination of SAS Grid Manager and SAS Viya can change the game for IT leaders looking to take on peak computing demands without sacrificing reliability or driving higher costs. Maybe that’s why we fielded so many questions about SAS Grid Manager and SAS Viya in our recent webinar about how the two can work together to process massive volumes of data – fast. Participants asked us so many great questions that we wanted to share the answers here, assuming that you may have the same questions. This is the first of two blog posts focusing on some of the very best questions we received. Stay tuned for more soon – and if you don’t see your own burning questions posed here, just post your question in the comments and we’ll respond. 1. Do SAS Grid Manager and SAS Viya need to be collocated in the same data center? The size of data being processed in each environment. How much data is going back and forth between the two. The impact all that data movement can have on response times and overall performance. In addition to performance, there's a greater sensitivity around data handling in physically separated deployments. The emergence of stricter data protection regulations increases the complexity of compliance when moving data between locations with different legal jurisdictions. It will be important to consider the additional performance implications of encryption of the transferred data as well. Ultimately, having compute as close as possible to the data it needs results in less complexity and better performance. In this case it is important to remember the old saying “just because you can doesn’t mean that you should.” When SAS Grid Manager and SAS Viya are collocated, they can share the same data. I need to be clear that there are implications of sharing the same data for example data sets. For example, the data cannot be open by both a process running on the grid and by the SAS Viya analytics server at the same time. If your business processes can accommodate this requirement then sharing the same physical copies of data in storage may save your organization money as well as ease compliance efforts. I also cannot sufficiently stress the need to complete a proof of concept with production data volumes and job complexity to compare the performance of hosting SAS Grid Manager and SAS Viya in the same data center, compared to having them in geographically separated data centers. 2. Should SAS Viya and SAS Grid Manager 9.4M5 run on the same OS for integration purposes? From an integration perspective, they can definitely run on different operating systems. In fact, as of version SAS 9.4m5, you can access a CAS (Cloud Analytics Services) server from Solaris, AIX, or 64-bit Windows. The CAS server itself will run on Linux – and soon we’ll roll out SAS Viya for Windows server. Short version: Crossing operating systems does not present a functional problem. Those of you who have used SAS in heterogeneous environments know that there are performance implications when processing data that is not native to the running session. You should carefully consider the performance implications of deploying in a heterogeneous topology before committing to a mixed environment. 3. How do SAS Viya and SAS Grid Manager compare in terms of complexity – particularly in the context of platform administration? They’re actually very comparable. Some level of detail varies but in many cases the underlying concepts and effort required are similar – especially when you reach the level of multi-node administration, keeping multiple hosts patched, and those sorts of issues. 4. SAS Grid Manager requires high-performance storage. Do we need to have that same level of storage (such as IBM General Parallel File System) for SAS Viya? No – SAS Viya relies on Cloud Analytic Services (CAS), so it doesn’t have the same storage requirements as SAS Grid Manager. It’s more like what you’d find in a Hadoop environment – the CAS reference architecture is mainly a collection of nodes with local storage that allows SAS Viya to perform memory-mapping to disk run jobs that need resources larger than the total RAM and can use disk cache to continue running. SAS Viya can ingest data serially or in parallel, so for customers that have the ability to use cost-efficient distributed file systems, movement of data into CAS can be done in parallel. Note, the shared file system that is part of an existing SAS Grid Manager environment could be further leveraged as a means to share data between the SAS Grid and SAS Viya environments. SAS’ recommended IO throughput for SAS Grid Manager deployments are based upon years of experience with customers who have been unsatisfied with the performance of their chosen storage. The resulting best practice is one that minimizes performance complaints and allows customers to process very large data in the timeliest manner. If SAS Viya is deployed with a multi-node analytics server (MPP mode) then a shared file system is required. The SAS Viya Cloud Analytic Server (CAS) has been designed with Network File System (NFS) in mind. Our customers get the best value from environments built with a blend of storage solutions, including both shared files systems for job/user/application concurrency as well as less expensive distributed storage for workloads that may not require concurrency like large machine learning and AI training problems. The latter is where SAS Viya shines. These were all great questions that we thought deserved more detail than we could offer in a webinar – and there are more! Soon we’ll post a second set of questions that you can use to inform your work with SAS Grid Manager and SAS Viya. In the meantime, feel free to post any further questions in the comment section of this post. We’ll answer them quickly. 4 FAQs about SAS Grid Manager and SAS Viya was published on SAS Users. 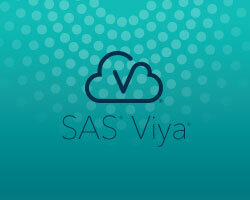 SAS Viya has opened an entirely new set of capabilities, allowing SAS to analyze on cloud technology in real-time. One of the best new features of SAS Viya is its ability to pair with open source platforms, allowing developers the freedom of language and implementation to integrate with the power of SAS analytics. At SAS Global Forum 2018, Sean Ankenbruck and Grace Heyne Lybrand from Zencos Consulting led the talk, SAS Viya: The Beauty of REST in Action. While the paper – and this blog post – outlines the use of Python and SAS Viya, note that SAS Viya integrates with R, Java and Lua as well. SAS’ Cloud Analytic Services (CAS) acts as a server to analyze data, and REST API’s are being used to integrate many programming languages into SAS Viya. REST stands for Representational State Transfer, and is a set of constraints that allows scalability and integration of multiple web-based systems. In layman’s terms, it’s a set of software design patterns that provides handy connector points from one web app to another. The REST API is what developers use to interact with and submit requests through the processing system. CAS actions are what allow “tasks” to be completed on SAS Viya. These “tasks” are under the categories of Statistics, Analytics, System, and Data Mining and Machine Learning. To access CAS through Python, the SAS Scripting Wrapper for Analytics Transfer (SWAT) package is used, letting Python conventions dictate CAS actions. To create this interface, data must be captured through a web application in a format that Python can transmit to SAS Viya. As an example, one project about wine preferences used CAS-collected data through a questionnaire stored in Python’s Pandas library. When the information was gathered, the decision tree was uploaded to SAS Viya. A model was created with common terms reviewers use to describe wines, feeding into a decision tree. The CAS server scored the users’ responses in real-time, and then sent the results back to the user providing them with suggested wines to match their inputs. SAS Viya has opened SAS to a plethora of opportunities, allowing many different programming languages to be interpreted and quickly integrated, giving analysts and data scientists more flexibility. How SAS Viya uses REST APIs to integrate with Python was published on SAS Users. 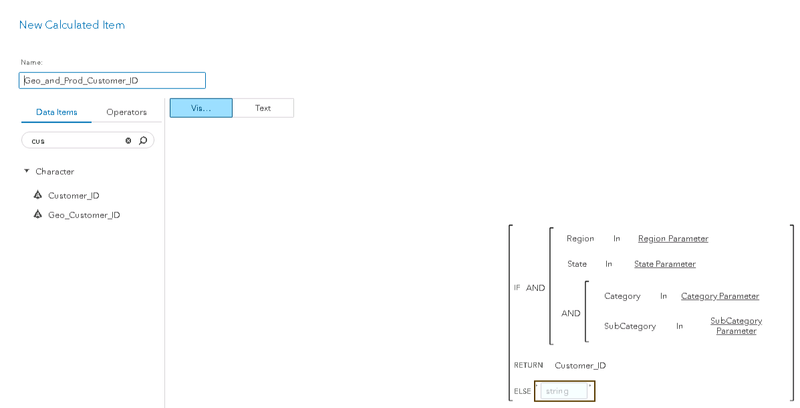 In SAS Visual Analytics 8.3, a Data View is a reusable and shareable template for a data source. That means that the data view is tied to the data source, and not to the report. If you update a data view it will not automatically propagate those changes into a report. Now you must be wondering, how do you save all these wonderful customizations for your data source? Answer: by creating a Data View. 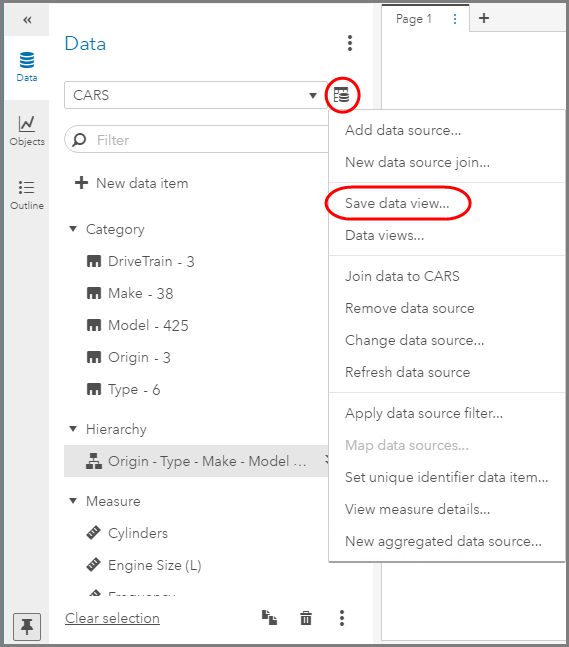 To get started, use the Data Source menu and select Save data view…. 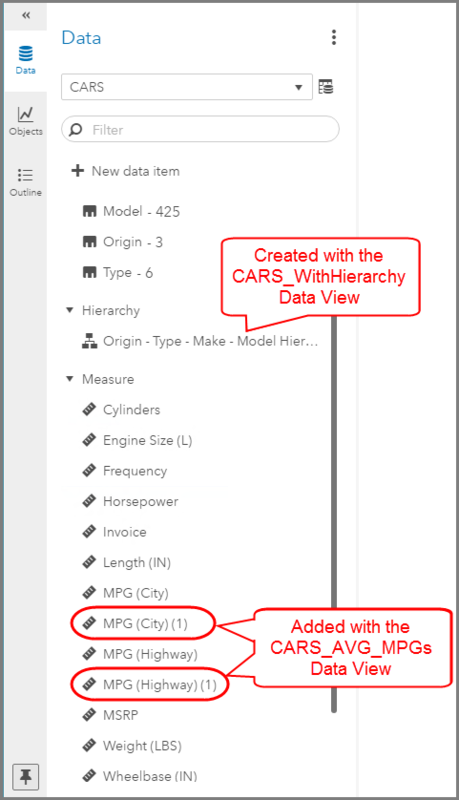 In this example, I created a hierarchy for the SASHELP CARS data set but as you can see from the list above you could have created many more calculations, custom categories, etc. Then give the Data View a name. A few other things you may notice about this Save Data View dialogue are the options for: Default data view and Shared data view. 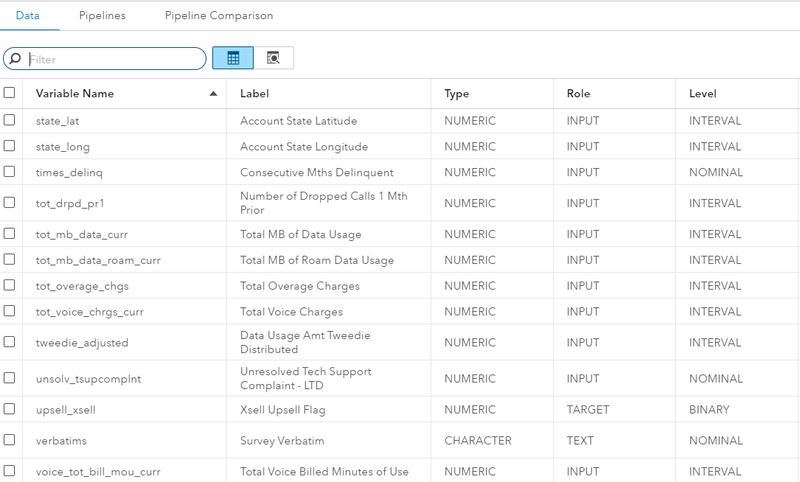 A default data view is automatically applied whenever the data source is added to the report. Each user can create their own data view of the source data and select their own default data view. This could lead to each user having a personalized default view. But, what if you want share your data views with others on your team? Or have everyone start with the same default view? That is when you need to first be an Application Administrator and second use the Shared data view option. In order to be able to share a data view, you must be an Application Administrator. Then the option to share a data view will be available. Once a data view is shared for a data source, other users with access to that data source will be able to apply that data view. 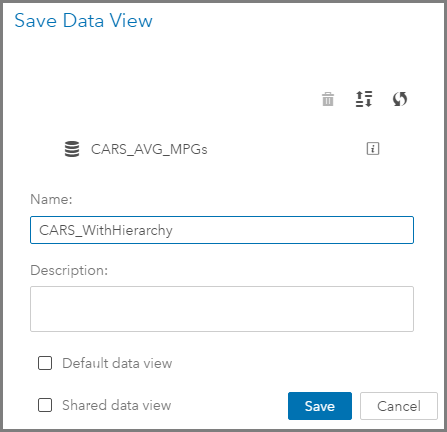 Data views are templates of saved settings, hierarchies, custom categories, calculated data item, etc. which can be combined in an infinite amount of ways. Therefore, it follows that multiple data views can be applied to the same data source. 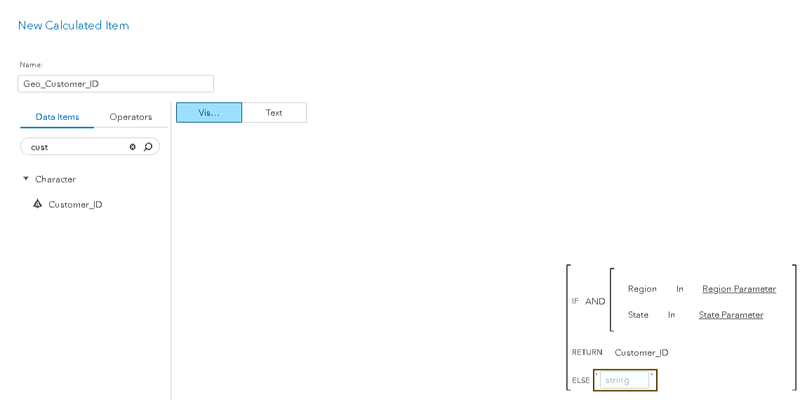 In the example above, I created a new hierarchy for the SASHELP CARS data set. But I could also create a new data view which changes the aggregation of the MPG measures to reflect the average aggregation and not the default sum aggregation. 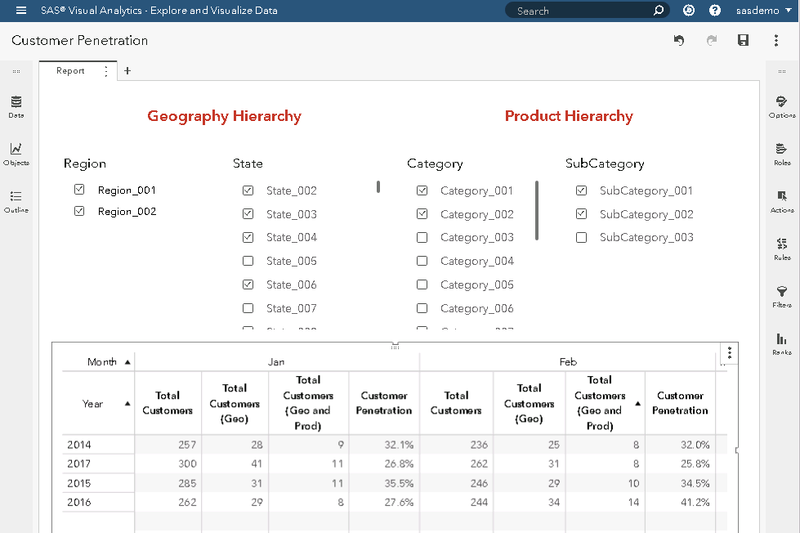 To apply a data view: open a new report, select your data source, then use the Data Source menu and select Data views…. You will see any individually created data views as well as any shared data views. Highlight the data view you wish to apply, then select Apply. Repeat for all of the data views you wish to apply. If any data items are duplicated with the addition of data views then, as shown below, those data items are given a (n) after their names. We've learned what Data Views are and that we can share them. How can we ensure that all the users who select a data source get the same starting point with a particular data view? To set this up, you must be an Application Administrator and the Data View must be Shared. Once these two criteria are met, you can navigate to the report's overflow menu and select Edit administration settings. Then select the data source and which data view to apply as the default for all users. 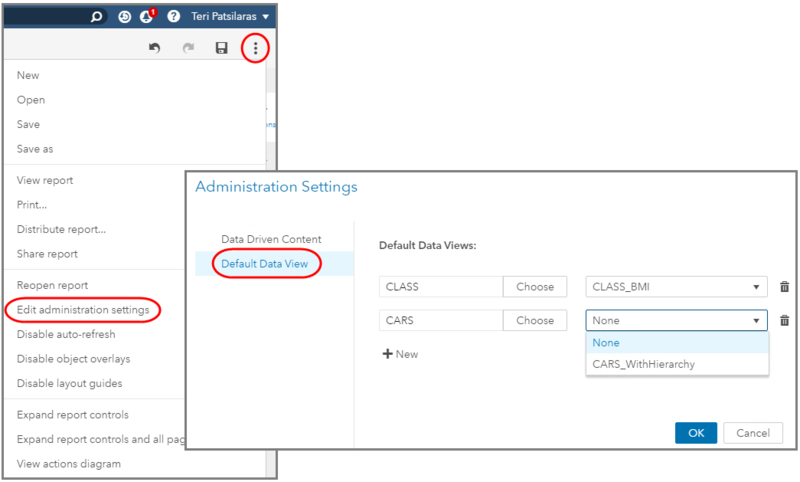 Caution: If the user has already selected a personal default data view, then the personal default data view overrides the administrator-set default data view. Remember that an individual user can apply a personal or another shared data view and override the default data view. Data Views are tied to a data source, not a report. If a data view is edited, those edits do not propagate to the reports that applied that Data View. A data source can have multiple Data Views applied. 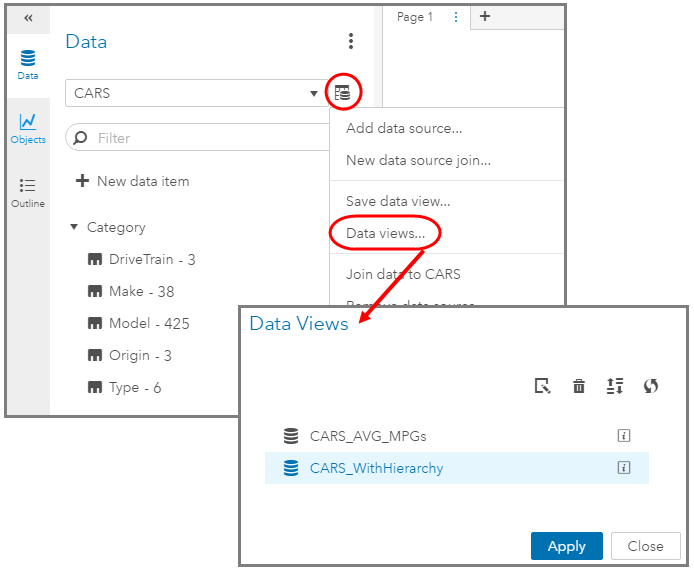 Only an Application Administrator can share a data view with other users as well as define a default data view for a data source for all users. Any personal defined default data views override the administrator-set default data view. Data Views are a template of data settings and edits – not a fully robust semantic layer where updates are pushed to all instances of usage. While Data Views can be used to assist in defining commonly used calculations and custom categories, remember that each user can still create their own data views and thus override the administrator-set default. 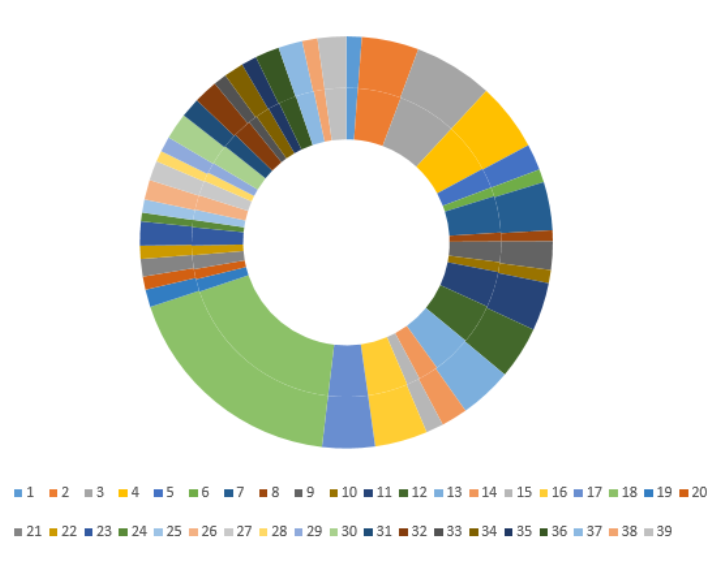 Using Data Views in SAS Visual Analytics was published on SAS Users. Last year when I went through the SAS Global Forum 2017 paper list, the paper Breaking through the Barriers: Innovative Sampling Techniques for Unstructured Data Analysis impressed me a lot. In this paper, the author raised out the common problems caused by traditional sampling method and proposed four sampling methods for textual data. Recently my team is working on a project in which we are facing a huge volume of documents from a specific field, and we need efforts of linguists and domain experts to analyze the textual data and annotate ground truth, so our first question is which documents we should start working on to get a panoramic image of the data with minimum efforts. Frankly, I don’t have a state-of-the-art method to extract representative documents and measure its effect, so why not try this innovative technique? The paper proposed four sampling methods, and I only tried the first method through using cluster memberships as a strata. Before we step into details of the SAS program, let me introduce the steps of this method. I wrote a SAS macro for each step so that you are able to check the results step by step. If you are not satisfied with the final cluster result, you can tune the parameters of any step and re-run this step and its post steps. Now let's see how to do this using SAS Viya to extract samples from a movie review data. The movie review data has 11,855 rows of observations, and there are 200,963 tokens. After removing stop words, there are 18,976 terms. In this example, I set dimension size of the term-by-document matrix as 3000. This means that I use the top 3000 terms with the highest TF-IDF values of the document collections as its dimensions. Then I use k-means clustering to group documents into K clusters, and I set the maximum K as 50 with the kClus action in CAS. The dataSegment action can cluster documents directly, but this action cannot choose the best K. You need to try the clustering action with different K values and choose the best K by yourself. Conversely the kClus action chooses the best K automatically among the K values defined by minimum K and maximum K, so I use kClus action in my implementation. After running the program (full code at the end of this post), I got 39 clusters and top 10 terms of the first cluster as Table-1 shows. Let's see what samples we get for the first cluster. I got 7 documents and each document either has term "predictable" or term "emotional." I set sampPct as 5 which means 5% data will be randomly selected from each cluster. Finally I got 582 sample documents. Let's check the sample distribution of each cluster. This clustering method helped us select a small part of documents from the piles of document collections intelligently, and most importantly it saved us much time and helped us to hit the mark. I haven't had a chance to try the other three sampling methods from the paper; I encourage you have a try and share your experiences with us. Big thanks to my colleague Murali Pagolu for sharing this innovative technique during the SAS Global Forum 2017 conference and for kindly providing me with some good suggestions. 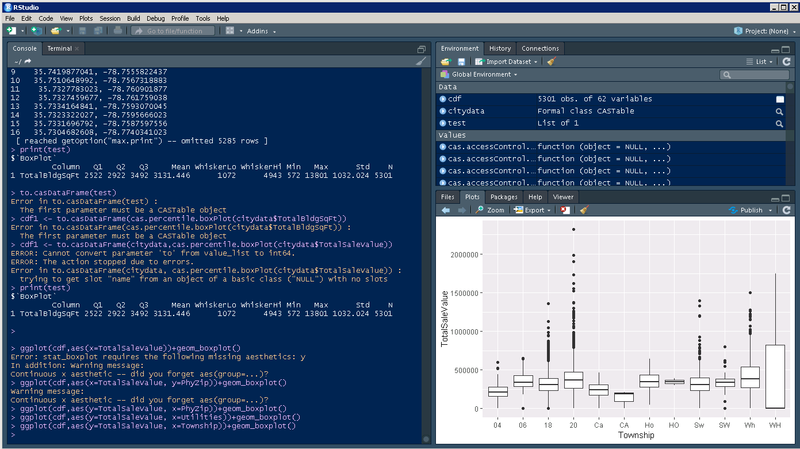 How to sample textual data with SAS was published on SAS Users.